Make pretty paper angels to decorate your table and tree using this free printable paper angel template. 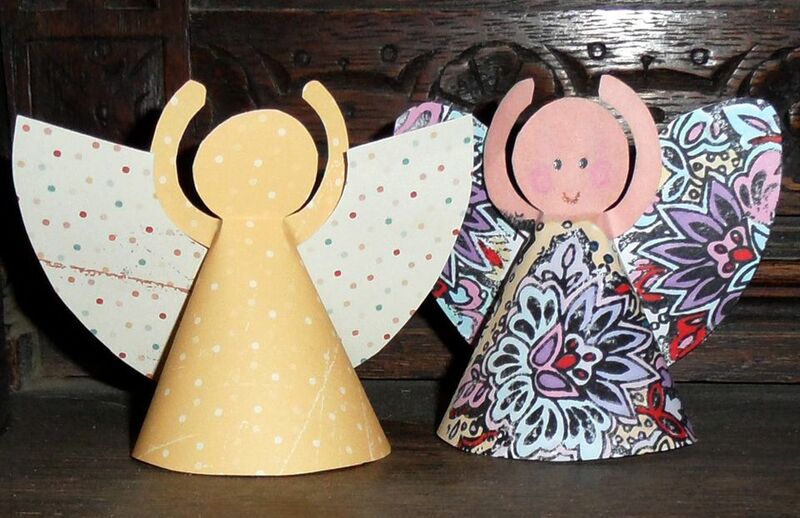 The angels are easy to make, simply cut the shape from the paper and then fold into a cone. While the template may look pretty one-dimensional, when the cone is folded the head, arms and wings of the angel will become apparent. The little paper angels will sit on a table surface and you could also attach a loop to her head to make her into a hanging tree decoration. There are many ways that this little angel can be adapted. Add the names of dinner guests, for instance, to make an unusual place name holder for a festive dinner. A number of the angels would look great attached to a ribbon or thread and used as a garland decoration. Customize the angel further by giving a decorative edge to her wings. You could, for example, cut a scalloped edge along the top of her wings to give a decorative effect. The part of the angel's wings that is showing is formed from the back of the paper. This means that a contrasting effect is achieved if you use double-sided paper, as I have done with the angel on the left of the photo above. The angel's dress can be decorated with subtle colors and decorations - or you can really go to town and create a brightly colored dress. Use rubber stamps with bold images and stamp these with brightly colored ink or use stamps with lots of scope for adding color. Make the angel sparkle by adding dabs of glitter glue to the dress. A bright embossing powder would also add color and shine to the dress of the angel. Paper doilies could also be used to give the dress a lacy effect, simply cut a shape from the lacy edge of a paper doily and adhere this to the angel's dress. Other embellishments such as stickers, stick-on jewels or decorations drawn with gel pens will also give the dress some sparkle. Note: Remember when you are decorating the wings that the back of the paper will be the part of the wings that are showing. This image shows the paper angel from the back. This shows how the wings are formed by overlapping the edges of the paper and using the slits cut in the paper to secure the wings in place. Instructions and a template for making these paper angels can be found on the previous page.